Despite having blogged about it here a week ago, I still failed miserably to sign up for any of the Heritage Open Day activities this weekend. We returned to Hursley this afternoon though for one that didn’t require booking. It’s a building that I’ve passed numerous times, generally en-route from work to the Dolphin pub in the village! 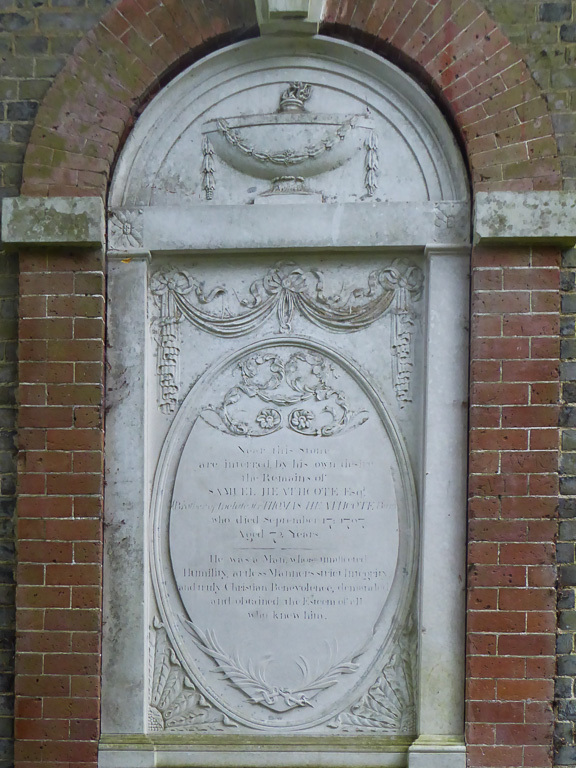 It stands in the grounds of the church and is the mausoleum constructed by the Heathcote family (who built the main body of the current Hursley House) over 200 years ago. * WPG2 Plugin Not Validated *We returned from holiday to two offers on our house. One buyer then leapfrogged the other taking us to well within 5% of the asking price. With no further bidding we decided to accept the offer. However, the following day the other buyer came back with a higher offer again. Just a couple of thousand over but they also had the advantage of being a cash buyer. This is our first time selling and we were at a bit of a loss what to do. Asking around at work and a quick poll on Twitter seemed to suggest we should simply go for the highest offer. In the end though we did the honourable thing and stuck with the offer we had already accepted. Hopefully the good will this generated will help smooth the rest of the process. Now we just need to find somewhere to move to! Posted in Uncategorized | Comments Off on Sold! After much indecision and procrastination we finally put our house on the market this week. Currently the plan is simply to make the most of the current downturn and upsize locally. That relies on us finding somewhere we want to move to though! At the moment I’m paranoid about getting a decent offer on our current place and being nowhere near finding somewhere we like. Our main problem is that we don’t need a massive house but we would like a decent sized garden. These days, if a property had some space around it, someone has invariably built an ugly extension on it! (Having viewed a few properties now we’ve seen a couple of those!) Anyway, if you’d like to buy a three bedroom house in Chandler’s Ford with a great outlook (or would just like a nose at where we live now!) then you can find the details on rightmove. We took Norwich Union’s free 7 day driveaway cover when we picked up our new car and, after a bit of research, I decided that I couldn’t beat the annual quote that they’d given at the same time. I’d asked them to phone me back on Friday so told them to go away when they phoned on Wednesday evening. Then no-one phoned on Friday! When I phoned them today I think I made the mistake of giving the reference number for the temporary cover rather than the quote. They then proceeded to give me another quote for Â£5 more. They agreed to match the price of the original quote though and we went ahead. Only when the paperwork for the original quote turned up in the post later in the day did I discover that they had also managed to increase the excess by Â£100. After another prolonged phone call they agreed to decrease it again but we’ll see what actually happens. We finally traded in our ageing Seat Leon at the weekend and on the way to Fritham I picked up the replacement – a three year old Focus 1.6 LX Estate. We couldn’t bring ourselves to buy an MPV but were looking for a little more space in boot. So far the only complaint is that the engine is a little on the noisy side, for example in 5th gear it’s happy pootling along at 60mph but any faster and it seems to be straining a bit. I’ll miss the handling of the Leon but not the massive servicing bills we’ve had over the past couple of years. After an enforced break due to my appendectomy I gave blood today for the first time in just over a year. It reminded me how painless the process is. Indeed, half an hour away from my desk in an otherwise hectic day was actually a welcome break. If you don’t give blood already, please do consider it. You can find your nearest session on the National Blood Service website. As previously mentioned, our car battery was dead on our return to the UK. After an initial jump start and subsequent charge from the mains everything seemed back to normal. On Friday we decided to try taking Emma over to her Grandparents’ in Monmouth after dinner. Unfortunately as we turned on to the M4, the battery light came on and was subsequently joined by ABS and airbag warning lights. I went for a run up to Holmenkollen this evening. My route back wasnâ€™t quite as I had intended as a large area has now been fenced off below the existing ski jump where they have started work on one of the new ski jumps for the 2011 World Ski Champs. At one point I accidentally ended up inside the fence and about thirty metres from an elk and her two calves, presumably having found an unusually quiet location so close to habitation. Sadly I had no camera to hand.